Commercial Surfaces is a leading provider of commercial floorcoverings for architects, designers, general contractors, building owners and building managers. We assist clients in determining the right type of floorcovering for their application with regard to budget, performance and aesthetic issues. 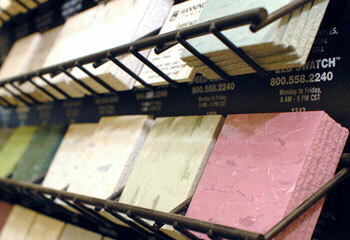 Commercial Surfaces is not owned by a carpeting manufacturer. We believe this can restrict the variety of goods and services we have to offer. Because designers thrive on providing unique looks for their clients, it is also a real bonus to be able to work freely with a wider range of flooring products. We carry thousands of samples in our showroom and can provide you with the expertise of an experienced flooring consultant. In 1976, Larry Hicks started the Carpet Services office, which later became part of a national company, out of his garage. After 25 years of working for other companies, his team, including Kurt Fielden, Rommy Cubillo, and Betty Fielden, began to consider starting their own commercial flooring business. From this, Commercial Surfaces, Inc. was born.